SQL performance books are tomes. SQL Performance Explained focuses on what developers need to know. …yet covering all major databases. Paperback also available at Amazon. SQL Performance Explained enjoys a five star rating at Amazon.com and Amazon.co.uk. Some readers have published longer reviews on their blog. 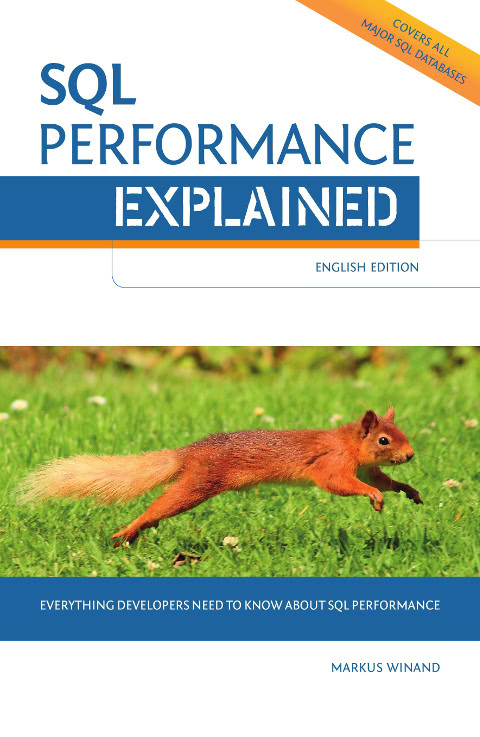 If you have bought the PDF edition of SQL Performance Explained before, you can download it again. You’ll get an e-mail with a link to the latest and greatest version. Markus Winand is an independent author, trainer and consultant on all things SQL. His book “SQL Performance Explained” has just been translated into a fifth language. It can be purchased as a print edition, and it’s also available to read for free on his use-the-index-luke.com website. Markus is currently working on his second book centered on the idea that things have changed a lot since SQL-92. It is likewise available free of charge online (modern-sql.com). Find his offerings for companies and developers at winand.at.